“This is a very belated review. And I mean that as a compliment. As soon as I finished reading Peter Ubel’s Critical Decisions, I immediately leant it out to a colleague as a very enjoyable “must-read.” She devoured it and passed it along to yet another colleague – and that was literally the last I saw of my copy, which I hope to eventually get back in some kind of battered but well-read condition. Yes, we’ve ordered more copies. But I think everyone keeps passing it on because Critical Decisions provides a wealth of history and information about medical decision making, and how doctors and patients each think about decisions. Perhaps most importantly, it shows the author confronting the reality of how medical decision making actually plays out in the real world. It starts by tracing the history of medical decisions. Yes, we’ve come a long way from the days where even a U.S. president wouldn’t question a physician’s recommendation for his wife to get something as life-changing as a mastectomy without even discussing the biopsy results, to a world where individuals and families have more opportunity to participate in and make decisions about their care. But on both the patient and the clinician side, so many factors influence and bias us, and we’re often unaware of it. First, as Ubel points out, decisions are also a burden. And when decisions get even a little tough we often look for ways not to decide. Yep, we defer. A common instinct is to ask our doctor what they would do if they were the patient. But it’s a problematic request, because our judgment changes when we’re actually responsible for the decision. 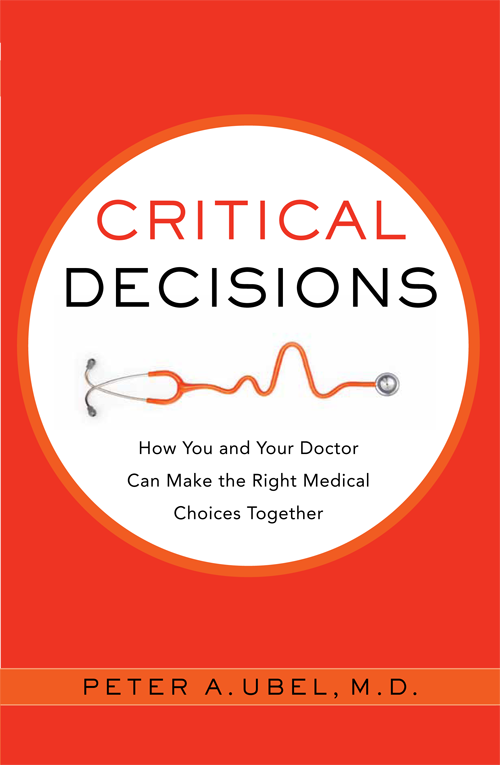 This entry was posted in Critical Decisions and tagged doctor-patient communication, shared decision making. Bookmark the permalink.